The wind is blowing a horrific cloud of polluted dust thousands of feet into the sky above the ancient Owens Lake east of the Sierra Nevada. I am driving north on Highway 395 past Olancha, at the southern tip of the lake, on the second day of my traditional Lenten desert retreat. I can see snow falling over the Sierra Nevada as clouds darken the mountain slopes down to the valley floor. 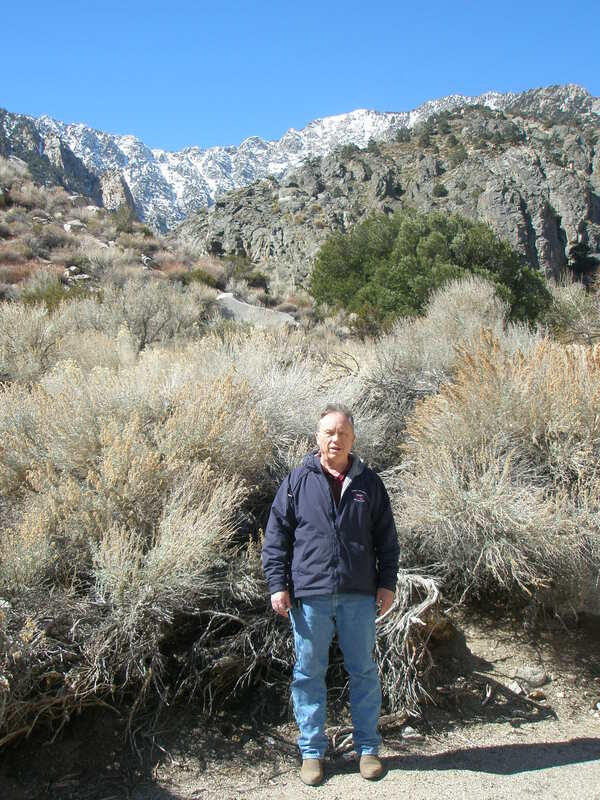 I am heading north toward Cottonwood Canyon, a place I have driven by dozens of times, but never visited. As I cross the highway bridge over Cottonwood Creek, the dry wash is filled with scars from previous flash floods. On the right side of the road, beside Owens Lake, I see a band of aspen, willow and cottonwood trees on the edge of an ancient shoreline. 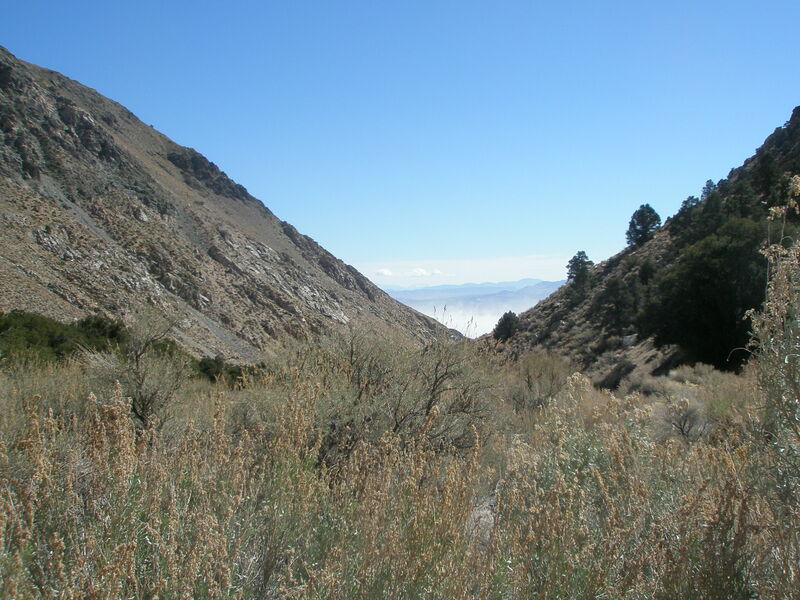 That is where the Owens Valley Paiute village of Sunga’va was located for 6,000 years and recently excavated by UC Davis. This was a verdant place, when the lake was high, with abundant duck, deer and antelope. A mile south of that village are the ruins of two charcoal kilns, built by Col. Sherman. 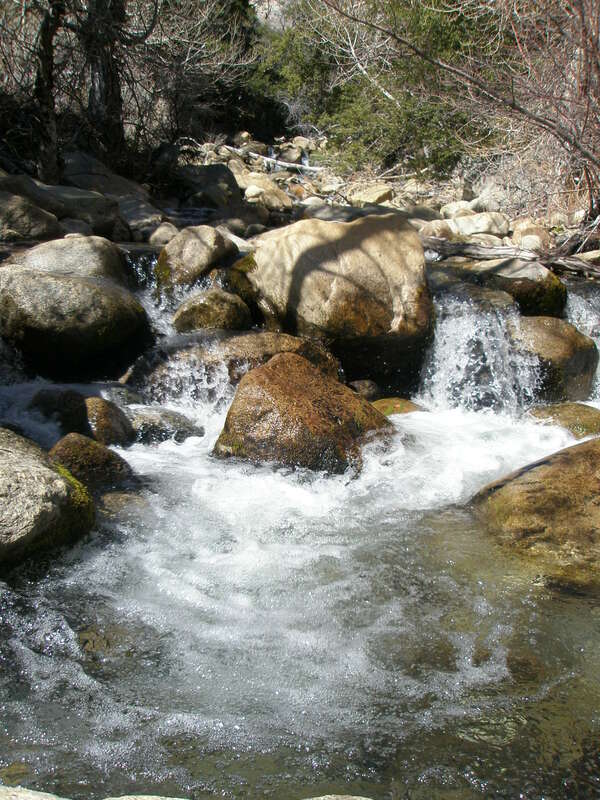 He also constructed a long wooden flume that went up into the Sierra and denuded the slopes of the pinyon pine, a key protein source for the Indians. Sherman made charcoal that was loaded on to a boat at a landing, also near the Indian village site. Small steamboats carried the charcoal across the lake in the 1880s to Swansea, when it was used to smelt silver ore. The wind is brutally strong, rocking my 2002 Oldsmobile Bravada. I see a small sign, “Cottonwood Road,” turn left off Highway 395 and drive toward the power station at the foot of the mountains. The dirt road crosses the Los Angeles Aqueduct that has drained the Sierra snowmelt for almost one hundred yards, directing the precious water toward booming Los Angeles. The dirt road continues left toward Cottonwood Canyon and alternates between graded gravel and paved asphalt for the next five miles. I guess the erosion of the road is further evidence of the violent storms that drain out of this canyon. The road climbs, twists and turns, and a wondrous sight unfolds before me, making it difficult to focus on driving the road. Huge granite walls loom higher and higher in beautiful and strange formations of red and orange. I am entering into the heart of the Sierra mountains. Tree topped crests covered in snow rise before me. Once I have entered the shelter of the canyon, the loud, rushing desert windstorm has been blocked out. Silence. Clusters of green oak trees are more numerous now and there is the sound of rushing water from the snowmelt thousands of feet above me. The sun is warm, the air still and not a single human can be seen. Suddenly a bobcat rushes past me. I am a stranger in this canyon and even the birds are silent. Deeper and deeper I drive into the twisting canyon. There is an old clapboard green building, maybe a Forest Service residence. But no one is here. This place was crowded with campers and fishermen during the fishing season, a place to retreat from the intense summer heat in the valley below. I park at the end of the road, which is the trailhead for the Cottonwood Trail, an ancient Indian trade route over the Sierra Nevada and now a popular summer hiking trail. I am at rest. My busy mind finds solace here in solitude in this canyon. A spirit of gratitude to God flows through my heart. I remember that there are also ghosts here: echoes of the presence of Paiute families, who lived and flourished in the canyon for ten-thousand years. There is also the echo of gunfire; a last stand of a Paiute chief and his warriors at the mouth of this canyon, who defended themselves from white settles in the 1860s. On March 19, 1863, Lieut. Doughty and twenty soldiers from Fort Independence with twenty citizens followed the trail of thirty-seven Paiutes moving south of Manzanar. “With sixteen dead on the field, the remaining Indians sought refuge in the waters of the lake. A strong wind blowing from the east interfered with their escape by swimming, and one after another was killed in the light of a full moon rising over the eastern mountains.” The Story of Inyo, by W. A. Chalfant. 1933. During the night, one surviving Paiute escaped westward into Cottonwood Canyon. I am remembering that battle and other struggles of the native people as I walk past a grove of oak trees. Somewhere near these trees is where native ceremonies such as weddings and naming rituals still take place. It is content with the low places the people disdain. Said to be a mythical figure, historians tell us that Lao Tzu lived in the 6th century BCE. The great Zhou dynasty had disintegrated in the Warring States period. Do you remember the great suffering, deaths and political chaos following the breakup of Yugoslavia? On a mega level, this is what was happening in China: wholesale slaughter of populations and burning of cities. Power was in the hands of ruthless warlords. How could the pieces of China be put back together? Two answers came forth. Confucius returned to the core values of early Zhou feudalism. The other answer came from Lao Tzu and Taoism: a withdrawal to nature and simplicity. I imagine Lao Tzu sitting on the rock next to me beside Cottonwood Creek. We gaze together at the water flowing from the mountain high above. Water is fluid and can penetrate the finest cavities. It flows to the low, receptive places, breaking down the hardest rock. The Tao is like water, nourishing all creatures without controlling them. Lao Tzu looked to the patterns and flow in creation, giving him intuitive insight about the nature of Ultimate Reality (the Tao) and how we should best live. “There is a being, wonderful, perfect. But does not on this account suffer. It wraps everything with its love as in a garment. And yet it claims no honor, for it does not demand to be Lord. I do not know its name, and so I call it Tao, the Way. When I reflect on the Tao with my world religions students at Saddleback College, I usually get blank faces. Up to that point, we had studied Hindu deities and Buddhist bodhisattvas, with vivid personalities. The Western mind struggles with the mystery of the Tao. As if to counter our Western need for categories and descriptions of the Holy, Lao Tzu short circuits our linear thinking in his teachings. As we read the Tao Te Ching, he gives us paradoxes to guide into mystery. I have had the same experience. As I grow in friendship with God, I have many times when I have confessed: I have been a priest for 42 years and I feel like I know nothing, I understand nothing. What I do know are my foundation experiences of the love and goodness of God. Chapter 3, translation by Stephen Mitchell. You will recognize some similarities to the teachings of Lao Tzu and Zen Buddhism. When Buddhism came to China, it blended with Taoism to create Zen. I remember that howling, jostling winds still blowing on Highway 395. The air is still and the quiet serene in this protective womb of canyon cliffs. Lao Tzu guides us to quieting our minds, practicing “no mind,” as the constant storm of voices and sounds assault us on the outside. In silent meditation, on this rock, I go to that deep place where God’s love flows. I cannot put words on those encounters, even though I try to write about this later in my journal. What I do want to remember is the intuitive encounter with Holy Mystery. “There is a huge silence undergirding us and inside of us that is trying to draw us into itself. To enter that silence is to enter the reality of God and the reality of our real communion with each other. For this reason, all great religious traditions and all great spiritual writers emphasize the need for silence at times in our lives…..as Thomas Merton put is, there is a hidden wholeness at the heart of things, and that hidden wholeness can only be discovered if we get to the deepest level of things. And the language we need to get there is the language of silence—the language of God and the language of intimacy.” “The Language of Silence,” Ron Rolheiser’s blog of January 28, 2007. I drive out of Cottonwood Canyon, anchored with the spiritual ballast of God’s Grace. I drive back into the wild winds of the desert. America Magazine, “The Deep Mystery of God,” by Michael McCauley (October 18, 2004). Tao Te Ching, translated by Stephen Mitchell. (I have a CD reading of this, which is very helpful when I have to drive into the traffic of Los Angeles). This entry was posted in Blog and tagged Centering Prayer, Cottonwood Canyon, desert spirituality, Lao Tzu, Martin Buber, mysticism, Owens Valley, Paiute, Silence, solitude, Tao Te Ching, Taoism, Thomas Aquinas, Zen. Bookmark the permalink.